My New Name – Hello Korea ! Seems everyone has a problem with my names. Leanne is too difficult to say. Everyone agrees I shouldn’t go by Young-Sook, since it doesn’t seem foreign -enough. Suki gets a weird reaction too. The language exchange guy told me I should change it. Over and over again. He really didn’t like it at all. He says it’s too familiar, and not keeping with the politeness level a person of my status should receive. So it makes him uncomfortable. Today at lunch, Y asked me if I had a nick-name. “Yeah,” I told her,” Suki.” No. She wanted a REAL nick-name. 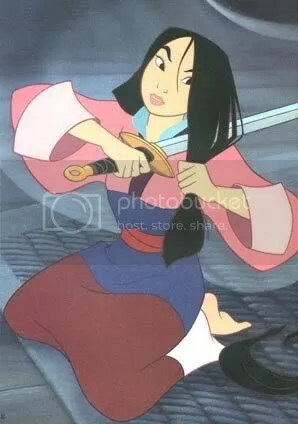 Like Cho-Sam-a being called “eating machine.” (the funny guy with the comb-over) So she made ChoSam-a come up with a name for me, and he ended up calling me Mulan (the Disney character) because he says I have big eyes and I am strong and brave. ha ha ha ha ha! Anyway, I thought you’d all get a kick out of that. They made a color print of her and have her hanging up by my desk now.